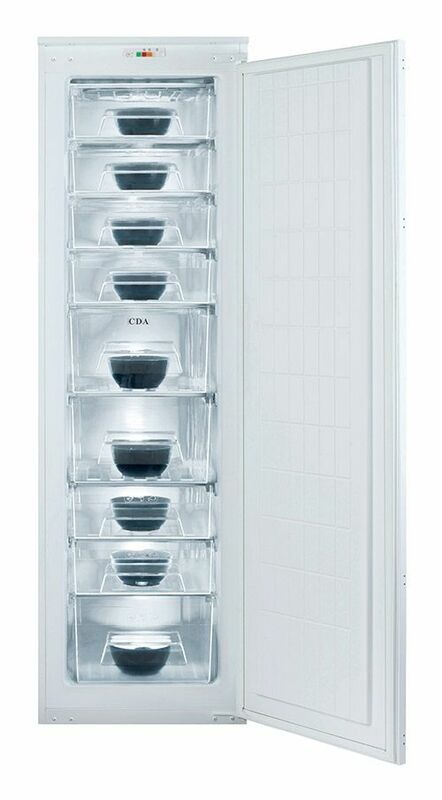 The FW882 Is a full height A+ rated frost free integrated freezer. 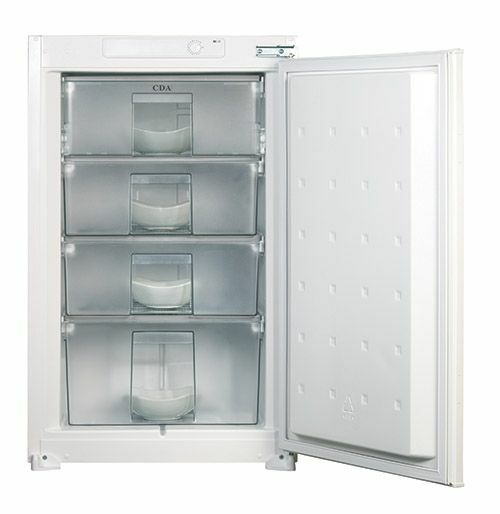 It boasts 7 storage compartments, electronic temperature control and a fast freeze function which allows you to add your shopping and freeze it quickly to lock in the nutrients. The reversible door means it will fit into any kitchen seamlessly and the frost free functions means you will never have to defrost your freezer again. All of these great features are rounded off with beautiful chromed edging on the shelves. Long term food storage, designed to be installed straight into your kitchen cabinetry. Just because it is not needed right away, doesn’t mean that you want to store it miles away. Keep your frozen food on hand with these models. Storing frozen food in a shed, garage or outbuilding might seem like a fantastic solution but your appliance may not be equipped to withstand the cold temperatures that this country can get down to in the depths of winter. The best bet is for you to store frozen food in an appliance fitted inside the house, where the environment can be controlled and your appliance kept safe from shock temperatures and water. Freezers are not the prettiest of appliances, let’s be honest. They feature little or no glass due to their need to be opaque and simply resemble a large, characterless box full of cold stuff. Fitting a freezer behind a décor door that matches the rest of your kitchen design is a smart idea as all the action goes on ‘behind closed doors’. Having the long term storage in your kitchen is also convenient because you can quickly get a chicken breast out for supper, at breakfast time or grab a cupful of frozen peas for your paella recipe, just when you need them…not to mention the late night choc ice craving scenario. Who wants to traipse down to the garage in their slippers for any of these things? What size you need will depend entirely on your food storage requirements. If you shop regularly, change your mind about what is for dinner as the week goes on or eat loads of fresh salads and fruit then a large fridge and smaller freezer could be the solution for you. Be sure to label your batch cooking before freezing it and even put a date on if you remember so that you know exactly what you have in the freezer, and how long it has been there. This will help you plan meals for the week, whip up a quick supper, save money on the weekly shop and help to cut food waste-a win all round! When you put new, chilled food into the freezer you can use the fast freeze function to quickly bring the items down to a safe frozen temperature quickly and stop them from warming up the surrounding frozen food. This is especially useful for meat. A freezer is an essential appliance for every family now, helping to store enough food to have something on standby all the time and make the best of bulk buy offers in the shops, batch cooking and advance meal preparation. To fit in with your lifestyle and kitchen design we have created a range of freezers in a freestanding format, integrated or combination fridge freezers that combine the best of both appliances. Click here to view our other freezer ranges. Whichever model you go for, rest assured that we offer the latest in energy efficient technology and highest star rating for long term food storage.